It's a time for tartan. For her latest public engagement, Duchess of Cambridge Kate Middleton stepped out in Dundee, Scotland on Tuesday sporting a Q by McQueen green and blue tartan coat dress accessorized with a mini green matching bag and finished off with black tights and heels. For an added bit of glamour, the mother of three wore sapphire and diamond earrings gifted to her from Prince William and originally owned by the late Princess Diana. The print was the perfect compliment to her and Prince William's visit to Scotland as tartan is often associated with the country. It also appears to be a favorite of Kate's as she's reworn the coat dress multiple times over the past years. 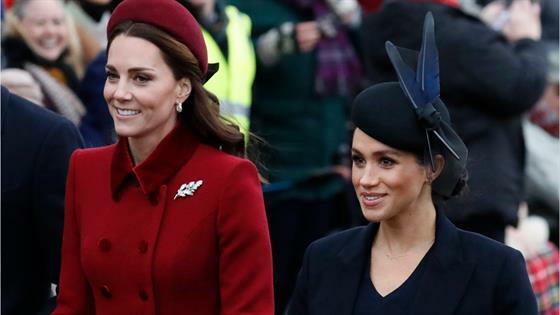 It's a style she seems to have in common with her famous sister-in-law, Duchess of Sussex Meghan Markle. Around this time last year, Markle also paid a visit to Scotland with Prince Harry, where she opted for a similar blue and green print in the form of a Burberry tartan coat while in Edinburgh. To boot, she also paired the look with a mini green purse. Great duchess minds think alike! While in Scotland this time around, Middleton, who is known as the Countess of Strathearn when in Scotland, formally opened the V&A Dundee design museum, for which she serves as patron, and is scheduled for various other engagements with Prince William while they are in town. "Last February, I was delighted to become Patron of The V&A in London. Now, nearly a year later, I'm thrilled to be standing in a brand new V&A: one which has been built for the city of Dundee and for Scotland, and which is already picking up international awards. In its first four months alone, it welcomed over three-hundred and sixty-thousand visitors—a truly remarkable feat," the royal said during her speech. "Walking around this world-class space, it's easy to see how Scotland's first dedicated design museum is already inspiring the next generation, by providing a new learning space for discovery. I have been captivated by the breathtaking architecture, and the sheer range of design on display. But, most of all I've been moved by the passion of the people who work here, and the dedication of all those who have helped make this important project to succeed," Middleton continued. "I believe we should celebrate all our leading galleries, museums, and cultural centers playing a greater role in communities, not just in London, but up and down the country, too. The cultural riches of the UK belong to all people of the UK. This is what V&A Dundee has achieved. The partners involved in this project from the local area, Scotland, and the UK more broadly all deserve enormous credit for the way you have collaborated to make this happen." As the duchess wrapped up, "I hope that this museum will serve as an inspiration to others, by showing how great things can be achieved when different communities all pull together. With this thought in mind, I am pleased to declare V&A Dundee 'officially' open. I wish you all every success for the future."